We're entering con season which means we'll miss a few page updates BUT here's a picture of Sergio to make up for it! He desperately wishes he was as slick as he looks here! 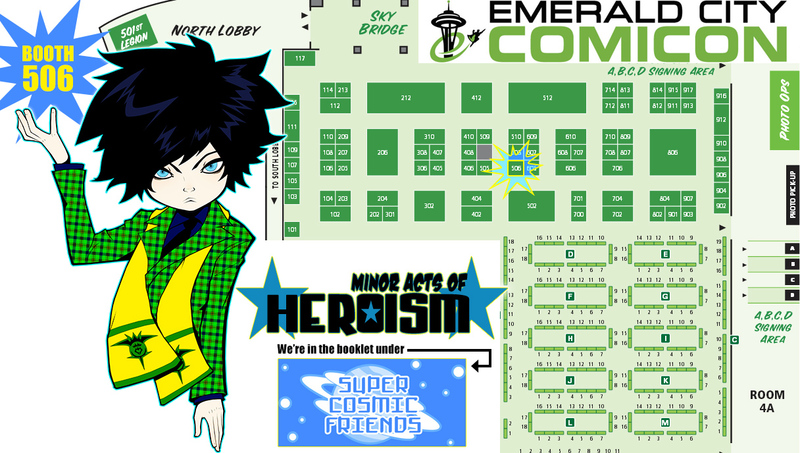 So we'll be at Emerald City Comicon this coming weekend! We're Exhibitor table 506! Under the name Super Cosmic Friends in the booklet! Please hunt us down and come say hi! We'll be the purple and pink haired ladies hiding behind the table!!! We'll have all sorts of MAOH stuff, including all new stickers and posters and prints, as well as some other stuff we draw (like artistically naked ladies which is for some reason the other stuff we draw). Please come say hi!!!! CLICK HERE FOR MAP AND LOCATION!!! Under the name "Minor Acts of Heroism"
new merchandise?! :OOOO does this mean that they might be listed in the shop soon for us east-coasters? ?